A new episode on my JavaFX UI series articles. For the application I’m currently developing, I’d like to have a nice window decoration so I worked first on the “Undecorator” series. Now, I need to mix HTML5 content in my JavaFX app so I decided to create a light framework to facilitate this hybrid ecosystem. 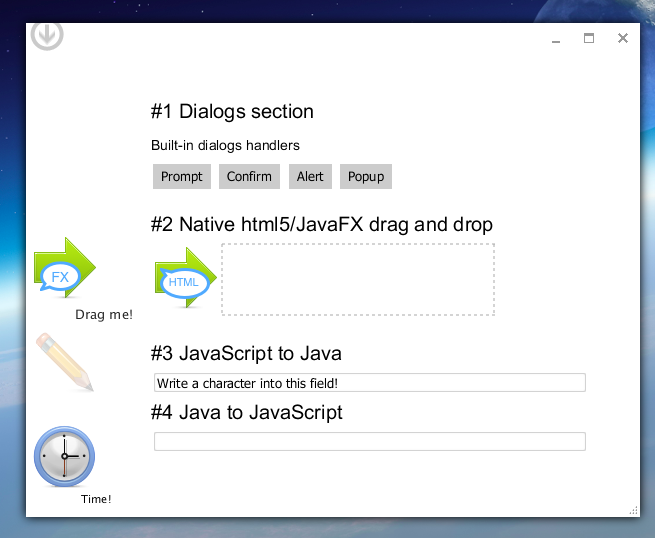 iBreed is a light framework for hybrid JavaFX/HTML5 applications. To use the best of both worlds! Leverage the JavaFX platform (desktop integration, file system, back-end, Frameworks, gestures…) mixed with the HTML5 “universal” content. Mixing technologies is not a recommended approach. Now days, things are going fast and reuse instead of rewriting could be a tactical and interesting step. And with JavaFX, this is possible ☺! More than a mixing framework, it should be “fused”. Combining JavaFX and HTML technologies means bringing the same experience to the end-user: same look and feel, same fonts, unique drag and drop… i.e. the user interface must look uniform, no visual difference between HTML and JavaFX parts (e.g. no URL loading progress bar ☺!). 1. A ready to run executable JAR to quickly test your HTML pages in a JavaFX context. 3. A polished windowing system for hybrid applications. Note: Since I based the windows look on a flat style, I incorporated JMetro style as the root CSS of all Scenes (BTW, great work from Pixel Duke http://pixelduke.wordpress.com, available in JFXtras 2). To Hybrid your App, take a look at the IBreedSkeleton class (https://github.com/in-sideFX/iBreed/blob/master/src/demoapp/IBreedSkeleton.java) that contains a minimal implementation. 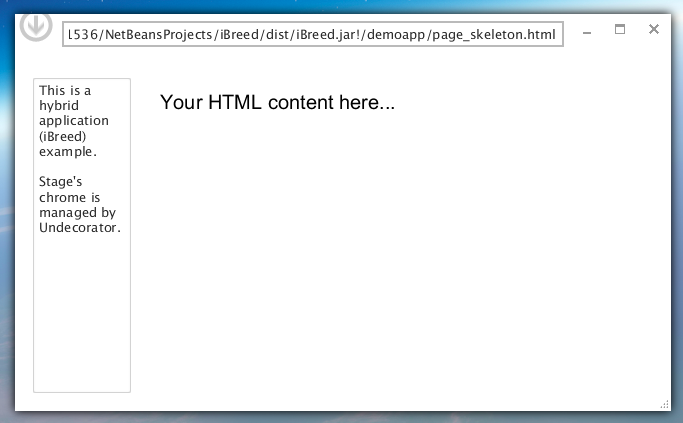 This “skeleton” provides an “undecorated” Stage with a customized WebView (WebViewInjector) fused with a basic JavaFX pane. Of course, include the iBreedDemo.jar (or get Undecorator.jar + iBreed.jar from repo) into your project. I also delivered a more complete example as a test “suite” for my hybrid application. • The two ways communication (Java to JS and JS to Java). • Providing a consistent Look and feel (CSS) across the app: Stage, JavaFX Node’s skin, HTML CSS. This entry was posted on 19/04/2013, 22:41 and is filed under iBreed, JavaFX. You can follow any responses to this entry through RSS 2.0. You can leave a response, or trackback from your own site. That’s really nice. Good job. Excelent work, I will read your code trying to make it even better, you are inspiring me. Continue this work and thanks you! Thanks a lot, happy to read that ! May the best Developer win 🙂 !